At the end I will also transform a sector labyrinth into the MiM-style. What is special in sector labyrinths is, that the pathway always completes a sector first, before it changes to the next. As a consequence of this, the pathway only traverses each side-arm once. Thus it seems, that sector labyrinths may be easier transformed into the MiM-style than other labyrinths with multiple arms. 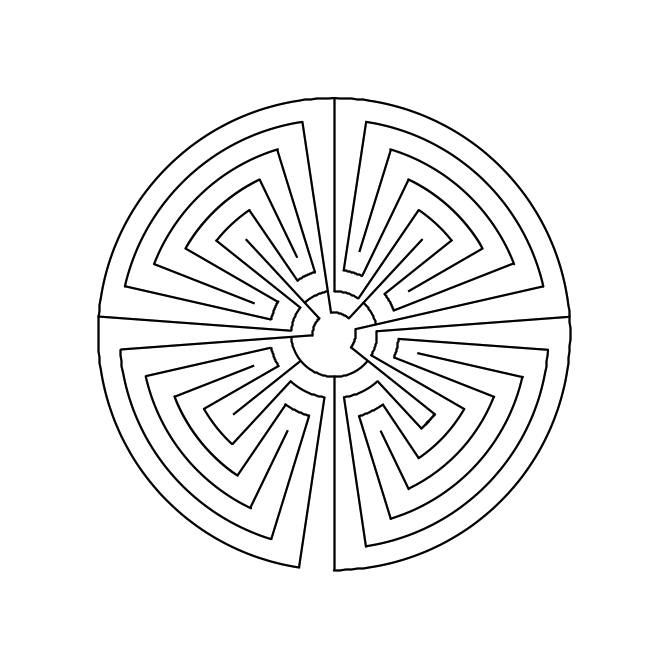 I will use as an example a smaller labyrinth with four arms and five circuits. There exist several labyrinth examples of this type. 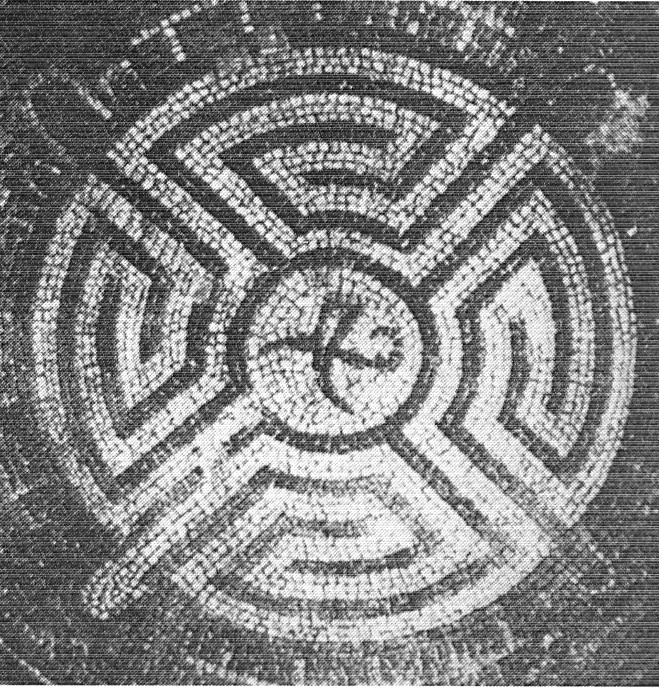 I have named it after the earliest known historical example, the polychrome mosaic labyrinth that is part of a larger mosaic from Avenches, canton Vaud in Switzerland. 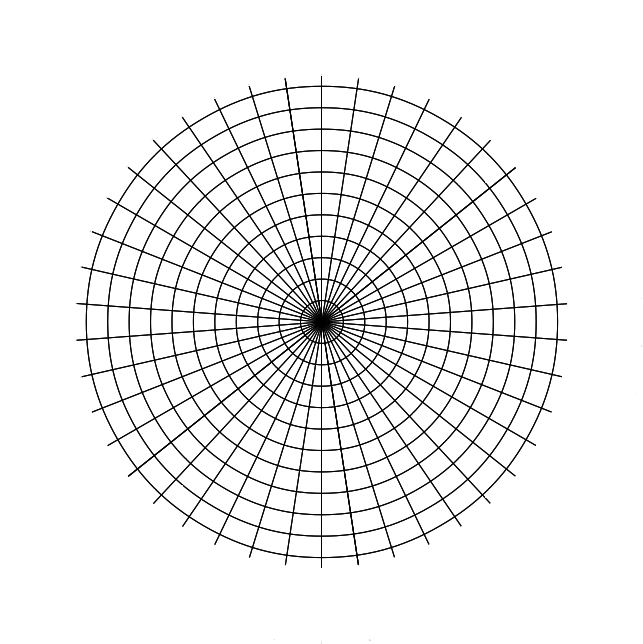 Figure 1 shows the original of this labyrinth (source: Kern 2000: fig 120, p 88). It is one of the rarer labyrinths that rotate anti-clockwise. On each side of the side-arms it has two nested turns of the pathway and 3 nested turns on each side of the main axis. The pattern corresponds with four double-spiral-like meanders arranged one after another – Erwin’s type 6 meanders (see related posts 2). When traversing from one to the next sector the pathway comes on the outermost circuit to a side-arm, traverses this on full length from outside to inside and continues on the innermost circuit in the next sector. In order to bring this labyrinth into the MiM-style, first the origninal was mentally rotated so that the entrance is at bottom and horizontally mirrored. 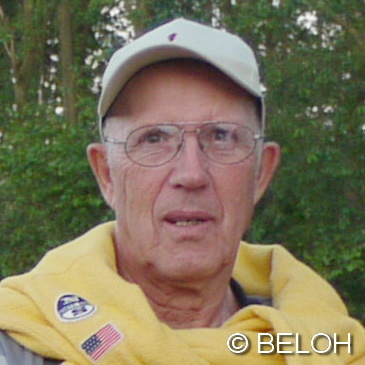 By this it presents itself in the basic form, I always use for reasons of comparability. Fig. 2 shows the MiM-auxiliary figure. This has 42 spokes and 11 rings what makes it significantly smaller than the ones for the Chartres, Reims, or Auxerre type labyrinths. The number of spokes is determined by the 12 ends of the seed pattern of the main axis and the 10 ends of each seed pattern of a side-arm. In fig. 3 the auxiliary figure together with the complete seed pattern including the pieces of the path that traverse the axes is shown and the number of rings needed is explained. For this the same color code as in the previous post (related posts 1) was used. As here the angles between the spokes are sufficiently wide, it is possible to use all rings of the auxiliary figure for the design of the labyrinth. We thus need no (green) ring to enlarge the center. 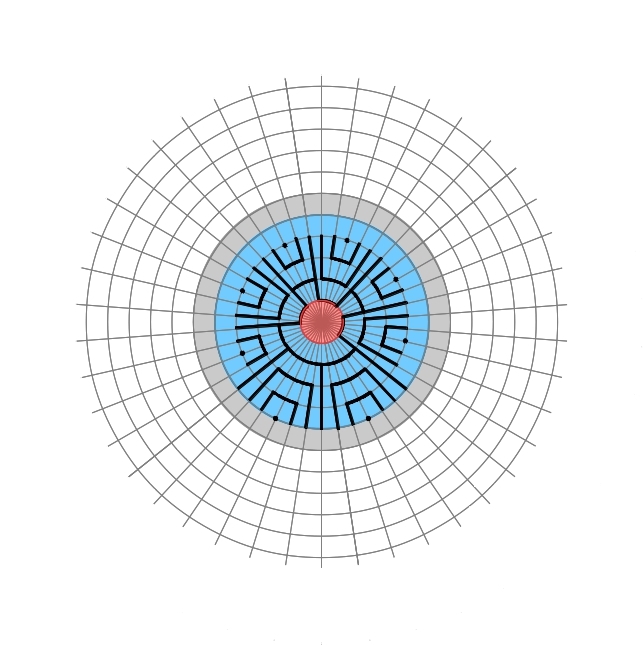 Only one (red) ring is needed for the pieces of the path that traverse the axes – more precisely: for the inner wall delimiting them –, four (blue) rings are needed for the three nested turns of the seed pattern of the main axis, one ring (grey) for the center, and five rings (white) for the circuits, adding up to a total of 11 rings. Fig. 4 finally shows the labyrinth of the Avenches type in the MiM-style. The figure is significantly smaller and easier understandable than the labyrinths with multiple arms previously shown in the MiM-style. Overall it seems well balanced, but also contains a stronger moment of a clockwise rotation that is generated by the three asymmetric pieces of the pathway and of the inner walls delimiting these on the innermost auxiliary circle.